The Year in Sports was a difficult one to figure out as the accomplishments of so many were often overshadowed by terrible actions of the few. It was a year where the Olympics provided great stories day in and day out and yet many to a backseat to other stories. Heroes rose in 2014 but they were not the stories that took precedence in 2014. Instead it was the fall of heroes that took most of the headlines this past year. It is a common occurrence in the world of sports especially with the evolution of the sports world. Years ago sports were their own entity separate of celebrity and had their own level of fame. The athletes were just assumed to be upstanding men and anyone that saw different said nothing. Now sports have entered the realm of the tabloids with TMZ creating a sports division and entertainment shows often reporting on athletes. This new realm has left many of the dark secrets of these athletes exposed as nobody is safe. It is both a positive and a negative as players can no longer get away with the terrible things that they can get up to in the off-season. Then again they are now at a level of celebrity where every move they make is scrutinized, even off of the field. There is no break for athletes anymore and depending on who you talk to that is a great thing or a terrible thing. 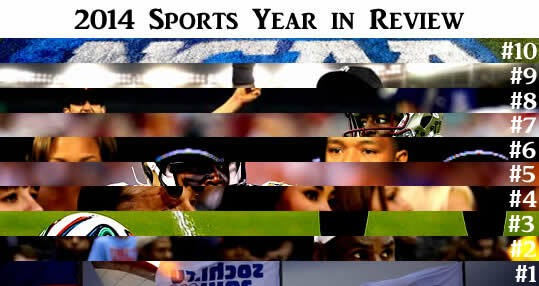 This year showed the ugly underbelly of the sports world was exposed and took over the headlines for 2014. Whether it was athletes getting into trouble or organizations taking a hit nobody was safe from the scrutiny of the public this year. That is not to say that there weren’t accomplishments throughout the year and great stories. Sports will always have these great stories that show the power that sports can have and the passion that people have for their sports. Still those stories often times are not the stories that people want to hear nowadays as many prefer to see the darkside of the sports world rather than celebrate the accomplishments. So the year was full of both but for the top stories of the year it was the negative that took the headlines and became the biggest stories of the year in the world of sports. With two massive events under scrutiny, a league taking fire, and players trying to change a culture the world of sports had plenty to talk about this year. The NCAA has been under scrutiny for the last few years as they continue to grow into a massive business but refuse to share the wealth. It has long been a controversy in the NCAA as they earn money from videos games and endorsements but the players remain poor. For the NCAA this is how it should be, although not for their players to be poor. The NCAA believes that the free education that these players receive is payment enough for their service on the field or the court. They believe that the free education should make up for any struggles that an athlete has because it will prepare them for the future. The players think otherwise though as they cannot make a living to help support themselves while they are at school. With a full schedule of classes and practice it is tough for players to fit in work that will allow them to pay for food, rent, and other living expenses. So quite often they accept money from boosters that will allow them to live while they play and prepare for a professional career. The only issue is that it is illegal to accept money and a player can be expelled while a program can suffer a worse fate if boosters are caught giving money to players. That leaves these student athletes with little to no options in an attempt to survive while in school. That is why former UCLA basketball player Ed O’Bannan filed a lawsuit against the NCAA that claims that players should gain financial compensation for the use of their image and likeness in commercial properties including the EA Sports video series. It was one of many lawsuits faced by the NCAA this year as they spent a lot of time in court trying to defend their business model with the sports world looking on. The model was challenged and many times he NCAA lost, forcing them to enact a new rule allowing the Power Five conference schools to decide on financial compensation that could increase the stipend the players already get in an attempt to correct the system. He was the face of baseball for the last decade as the captain of the biggest team in baseball but this was his last year. Although he is only one player, he is one player on the most talked about baseball team in the world. The New York Yankees are a different type of team that seems to dominate conversations of baseball. They are the most successful team in the MLB and often times take over headlines throughout the year. Their season may not have been the best this year as they missed the postseason but that didn’t keep them out of the headlines. They had some negative press with Alex Rodriguez missing the entire season due to steroids but most of the talk surrounded the team captain. Derek Jeter was one of the best shortstops in the game and one of the greatest offensive players. It was not the numbers that put him among the greatest though as it was more about the ability to be consistent. Jeter became known as a clutch player but the fact was that he was just consistent. When the postseason came he was a player that would do the same thing that he had done all season. That was his legacy and in 2014 he took his final tour around the MLB as baseball said goodbye to a great player. More than anything else he was the last remaining untouchable athlete. It was more than the retirement as his leaving the MLB marked the end of an era. Despite what Jeter did it never seemed like anybody knew anything about him. There were rumours of his womanizing but never any proof and nobody ever attempted to get proof despite the reports. He was one player nobody wanted to talk about and he will likely remain the last player of that ilk to be in sports and be as popular as he was. It was the end of an era in Yankees baseball and the MLB but above all it was the end of a forgotten era where tabloids were not as important as letting a player simply play. Baseball takes another spot in the top story and this time it was about the emergence of a great pitcher. Often legends are made over time, like Jeter who was so consistent over multiple years that he became the face of baseball. Legends are never created in slow time as they are created with great play over time but there is always a moment that a legend turns from a normal player to a hero. That moment may have just come for one pitcher this year in the World Series. The San Francisco Giants were set to take on the Kansas City Royals in what was a surprising World Series matchup. Both teams had come from the Wild card and neither were expected to do much in the ways of the postseason. Yet both ran through the competition with the Giants losing one game and the Royals going undefeated. It was two teams getting hot at the right time and that made for an intriguing matchup in the Fall Classic. The Series was one of the greatest in recent memory with both teams going back and forth and the Giants taking the series in seven games. Perhaps most impressive though was the performance of the Giants’ top pitcher. Madison Bumgarner was the difference for the Giants in the World Series and the postseason in general. With a 1.01 ERA throughout the postseason, Bumgarner solidified himself as one of the greatest pitchers in postseason history. It seemed as though every time that Bumgarner was on the mound the Giants were set for a win and there is nothing more than a team can ask for than to have a pitcher that can bring the peace of mind that Bumgarner brought. In the World Series Bumgarner was that much more impressive pitching in three games including two starts. In those three appearances he had a 0.43 ERA and 17 strikeouts going 2-0 with a 5 inning save performance in Game 7. It was a masterful performance that will go down in history as one of the greatest of all time. It was a strange year for Jameis Winston that came with the highest of highs and some very low lows. He started 2014 as the Heisman Trophy winner and the best college football player with an extremely promising future. He had another year ahead of him to continue his pursuit of the top draft pick in the NFL along with a potentially great NFL career. He topped a great 2013 season off with a win against the Auburn Tigers in the National Championship. The NCAA greatest player had won everything he could and was still young enough to lead the Florida State Seminoles to another championship in 2014. The year was looking great for Winston as he had the entire world in front of him with one more year before he likely declared for the draft and became and NFL star. Then the off-season hit and everything changed for Winston thanks to the poor decisions of Winston. The high of winning a national championship did not last long as his off-season began with accusations of sexual assault were being investigated by the Tallahassee police department. Winston was exonerated of the crimes later in the year due to irregularities in the victim’s reports. As these accusations were dying down Winston was caught on camera steeling crab legs from Publix. As the season began the Seminoles hoped to see the end to the many issues that Winston had in the off-season. It would only continue in the regular season though as he was seen, and heard shouting a lewd comment on campus that eventually had him suspended for the opening game of the season. At the start of that game Winston came out with pads to the sideline and had to be told to take the pads off and come out in a T-Shirt. The issues that Winston has gone through this year have put his future in serious doubt. His maturity level has been questioned with the issues piling up and the Heisman being taken away from him due to these issues as he remained in the headlines, for all the wrong reasons, in 2014. The issues of players did not stop in the NCAA as Jameis Winston was the face of issues in the NCAA while Ray rice played that role in the NFL. This year was a tough one from the start for the NFL as they had a massive image problem at the start of the season. It has been a battle for the league in the last few years with players continuing to get in trouble off of the field. With drugs becoming a massive issue the NFL had done little to curb the issues that players have. They were trying to walk the fine line between telling players what to do in their own time and protecting the brand of the NFL. They had done little to help end the trend of players getting in trouble and that became a bigger issue as the NFL prepared for a new season. In the off-season the issues had already started as Rice had been accused of domestic violence against his fiancée. The accusations stemmed from a night in New Jersey where Rice knocked his fiancée unconscious in an elevator. The NFL had taken limited measures to punish Rice suspending him for two games of the season. Then the video from inside the elevator came out showing Rice punching his fiancée and knocking her unconscious. With the new evidence the NFL suspended Rice for an entire season and the Baltimore Ravens released their star running back. The league came under fire for the decision as their two-game suspension seemed too lenient for the crime until the video was released by TMZ forcing the NFL’s hand. Many believed that the NFL could have received and seen the video if they wanted to but they didn’t try to find out. Rice wasn’t the only player to get into trouble as star running back Adrian Peterson was accused of child abuse after hitting his four-year-old son with a switch. With a new code of conduct in place when Peterson’s accusations came through he was suspended for the year. The two massive issues put the NFL in a tough situation where they had to try to fix their code of conduct as the image of the league took another hit. The sports world has taken steps in the last few years to become more accepting of all cultures and all backgrounds. A massive step was taken when Jason Collins came out as homosexual becoming the first ever gay professional athlete. It was a step in the right direction for sports as the support for Collins was overwhelming and began to show that the only thing that matters in sports is if you can play. The issue with Collins was that he was an aging player that essentially rode the bench and did not seem to be good enough to start. He was signed by Brooklyn but did not see much time on the court. That is why Michal Sam became the face of gay men in sports this year. The SEC defensive player of the year came out as gay before the NFL draft and put the ball in the court of the NFL teams. Would they accept a gay player? If he go cut was it because of his sexual preference or because he wasn’t good enough? Would a team pick him in the draft because he was gay or because of talent? The questions were all around and Sam seemed to be good enough to be drafted but his draft stock did fall due to teams’ fear of the locker room balance. Eventually he was drafted by the St. Louis Rams and when he was drafted he revealed the ugly side of the sport. When his name was announced cameras caught him kissing his boyfriend sending NFL players and fans scurrying to let their opinions be known. It was far from positive and with Sam not making the team out of camp it was clear that the NFL might not be ready for a gay player. It was a step in the right way but in the end the culture wasn’t changed in the NFL as they remained in century old ideas that could not find a spot for a player who won the defensive award in the best defensive conference in the NCAA. Homophobia was far from the only ugly side of sports that was exposed this year as racism took a starring role as well. It is not that racism has never been shown in the sports world before as hockey had seen it multiple times in the last few years. With racist tweets coming out against the few black players in the league the NHL has dealt with this issue before. It is not accepted in the NHL but for a league that is mainly white it may, unfortunately, be expected when someone different becomes an enemy of a fan base due to his great play at important times. In the NBA, a mainly black league, it is something that is rarely expected for heroes and enemies often have the same colour skin. Yet this year racism crept up in the NBA and it was not from the uncontrollable fans but from inside the structure of the NBA. It was in April when a recording surfaced that had Los Angeles Clippers owner Donald Sterling making racist comments. In a conversation with V. Stiviano, a female friend who recorded the conversation, Sterling said that he wished that Stiviano wouldn’t bring black people to Clippers games. The comments sent the NBA into a tailspin as the owner of one of the biggest franchises in the league seemed to be racist towards the very ethnicity that made up most of his team. Sterling sued Stiviano for recording him without his knowledge while players and fans of the NBA called for action against Sterling. It was a test for new NBA commissioner Adam Silver and to many he passed with flying colours. Silver banned Sterling, for life, from the NBA and fined him $2.5 million, the maximum fine. Along with his ban, Sterling lost control of the Clippers, it was given to his wife, and the team was sold. It was a shocking event in the history of the NBA but in the end they came out on top refusing to tolerate racism in a league made up predominantly of black players. The world’s eyes were on Brazil in the biggest event of the year as the World Cup captivated many around the world. It is the world’s most popular sport and for that the World Cup is the largest sporting event on earth. People from everywhere watch and travel to see the games and despite the lack of popularity in North American It remains the biggest sport event every four years. This year the world watched as teams battled to be named the best in the world in the biggest sport in the world. In the end it was the Germans who came out on top as they took the World Cup and were named the best team. It was a thrilling tournament with more close battles than ever before and teams that were never expected to be good winning games that seemed out of their reach. It was one of the best tournaments in recent memory and was once again one of the most watched sporting events in the world. The games seemed secondary this year though as the focus became the host country themselves. Brazil had won the right to host the World Cup in 2014 and will play host to the next Olympics in 2016. Yet despite their recent position in the sports world they are still a developing country. That is why the decision to have these major events came under great scrutiny. The World Cup was the chance to see what Brazil could do with the event and in the end the legacy will tell a better story. Building stadiums in remote locations that will never be used again and spending taxpayer money to host games beside favelas was not the greatest legacy to leave. The games were good and the tournament went on without incident but the legacy of the World Cup and of FIFA took a hit as Brazil is not better off than they were before, in fact they may be worse. As the World Cup left the preparations continued for the Olympics in another spotlight that the country may no longer want. He is considered one of the greatest players to ever play in the NBA and his movements through the league have always made headlines. When LeBron James was drafted by the Cleveland Cavaliers it was a story that could not be written any better. James was born and raised in Akron, Ohio and was now drafted by the only professional team in the state. It also allowed for a struggling team to add the type of player that can turn a franchise around. There are not many like James as his skillset coming out of high school was compared to the likes of Michael Jordan. He was the next great one and was crowned King James before even stepping foot on the NBA court. He was taken by the Cavaliers and showed that the talk of his ability was not exaggerated. He lifted the Cavs to the playoffs and made them a competitive team in the league. Then everything changed when he became a free agent and decided to announce, on national TV, that he was going to Miami. It worked for him as he joined Dwayne Wade and Chris Bosh in winning two NBA championships with the Heat. LeBron had alienated his biggest fans though as he left his state and did it in a way that made him seem extremely selfish. He left to win championships, which he did not think he could do in Cleveland, and to him that was a good enough reason to leave. With the championships under his belt, James had a big decision to make becoming a free agent in 2014. His latest decision was one of the most talked about stories in the sports world this year as the debates began over where he would go, or if he would stay in Miami. In the end it seemed like James wanted to make things right and he returned to Cleveland. It was the biggest free agent signing in sports and immediately brought James back into one of the most loved sports stars in North America as his biggest mistake was corrected. It is hard for any story to overshadow the Olympics in an Olympic year as it was one of the biggest events of the year. Aside from the World Cup there is rarely a bigger event in sports on the year and every Olympic year it will be a top story. Much like the World Cup this year the Olympics took focus for the entire time that it was on but it wasn’t the accomplishments that took focus. The Olympics always provide so many stories throughout the weeks that the games are on. It is an event that features athletes from all walks of life and any of these athletes can win gold achieving a dream. It is the stuff that writers live for as every day there is another underdog story or a story of athletic dominance. Yet that wasn’t the main storyline this year as Sochi itself took focus. Again like the World Cup the Olympics were in a place that most believed to be a bad choice for the games. One reason was that Sochi simply didn’t exist before the Olympic bid as the city was essentially created for the Games. That is a tall task for any Olympic Committee and one that is far from cheap. The bigger issue was that it was in Russia, a place notoriously known for being as close to a dictatorship as possible. Vladimir Putin had been in power for a long time and many of his laws infringed on human rights. None more than a law passed just before the games that did not allow any homosexual “propaganda.” That rule essentially stated that being homosexual is fine as long as it is kept out of the sight of anyone anywhere in Russia. Along with this there were multiple terrorist threats leading up to the games while spending on the games came under question. The games went off without a hitch but it was another questionable decision made by the IOC and one that put them under tremendous scrutiny for corruption which will continue a year away from the Brazil Olympics as the top story was not one of positivity but one about the seedy underbelly of the sports world.